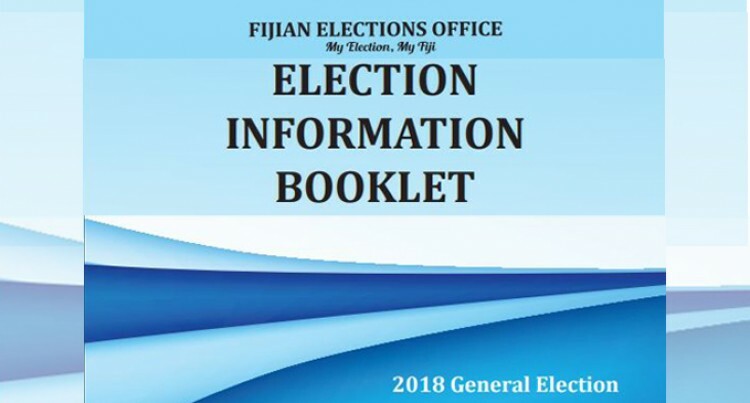 The Fijian Elections Office (FEO) has delivered 75,373 voter instruction booklets (VIBs) to cater for the 69,466 regis­tered Pre-poll voters. Distribution of the instruction booklets started last Wednesday, with 112 voter awareness assistants deployed to engage with voters. The booklet contains the num­bers, names and photos of the re­spective party candidates standing in the election. The same booklet will be handed to voters on election day – November 14. FEO’s director of strategic devel­opment and communications, Ed­win Nand, said their voter aware­ness teams were about to complete distribution in pre-poll areas and move to election day distribution from yesterday. “The FEO wants to ensure that every registered voter is able to obtain a copy of the VIB in order to study it and confirm the number of their candidate of choice,” Mr Nand said. “Teams will be doing house-to-house distribution. They will knock on doors and personally handover voter instruction book­lets to voters. To date, 4925 booklets have been distributed, with 17 venues left to be covered in the Lau Group, he said. Mr Nand also said the Lau voter awareness teams were currently in Vanuabalavu and would later move to Yacata Island before returning to Suva. They were unable to cover Vatoa and Ono-i-Lau islands be­cause of cold weather conditions and would await an update before continuing their work. “Apart from Lau, we have distrib­uted 1245 VIBs in Rotuma, 5084 in Lomaiviti and 5982 in Kadavu,” he said. “For the Western Division, the booklets have been distributed in eight areas – Yasawa/Vatulele, Lau­toka, Nadi, Ba, Tavua, Sigatoka, Keiyasi and Rakiraki. In the Northern Division, 18,600 booklets have been distributed cov­ering areas like Taveuni, Nabouwa­lu, Savusavu, Labasa and Seaqaqa.